It was a quiet day back at Bright House Field with the majority of the camp in Bradenton. Those players not on the trip, worked out here this morning and then had the rest of the day off. It won’t be quiet here tomorrow. The Yankees are coming. As indicated yesterday, 500 tickets to the outfield berm will go on sale at 9 a.m. tomorrow morning. All the seats are sold. Weather will be great and fans back in the Philly area can see the game on CW Philly 57. Harry Kalas and Tom McCarthy arrived today and will be behind the mike. Matter of fact, all broadcasters who do the games, radio or TV, are now in Clearwater. The Yankees also mean a lot of media. All seats in the press box are labeled to make sure the major media folks have seats. Chien-Ming Wang from Taiwan will be pitching for the Yankees. Media from Taiwan and China are on the list. With So Taguchi on our roster, we have more Japanese media here on a daily basis. Media from Latin America will also be coming to camp from time to time. Baseball truly is an international game. Well, sort of. We have 31 pitchers in camp and the Pirates have 38. So, the two clubs will play a 9:30 a.m. “B” game in Bradenton and then a 1:05 p.m. game in the afternoon. Bus time for the 44 minute trip south for the “B” game players is 7:45 a.m.; the other bus is 9:30 a.m.
Brett Myers and J. C. Romero will be in the early game. J. D. Durbin, Shane Youman, J. A. Happ and Joe Bisenius are listed for the afternoon game. We all know Myers and Romero are on the staff but the afternoon crew needs to face the Pirates’ “A” lineup. A two-team bowling challenge was held last night with Ryan Howard, Jimmy Rollins, Brett Myers, hitting coach Milt Thompson, non-roster invitee Brandon Watson, former Phillie Robert Person, third base coach Steve Smith, minor league catcher Tim Gradoville and Shane Victorino. The last two NL MVPs (Howard/Rollins) and the last two Phillies to have 7 RBI in a game (Howard/Person). The Phillies return to Bright House Field on Saturday, hosting the Yankees at 1:05 p.m. (CW Philly 57 TV game). But, 500 tickets to the outfield berm area will go on sale at 9 a.m. on Saturday morning at the ticket office windows. Brad Lidge was in uniform again and played long toss in the morning . . . Kris Benson faced hitters for the first time in batting practice and threw very well. The Grapefruit League is officially under way, a game this afternoon against the Reds at breezy and very chilly afternoon Bright House Field. Chilly, not as in Alaska but chilly as in not typical for Clearwater. As usual, Ken Mandel is the source on this site for all news stories about the Phillies. Tomorrow, the Pirates are here and the 1:05 p.m. game will be broadcast on phillies.com, the first 10 such broadcasts. The Phillies and their opponents will use the designated hitter in each of the first 10 home games this spring. On March 17, the Phillies will play traditional NL baseball against all opponents. Billy DeMars, Phillies coach from 1969 through 1981, stopped by Bright House today. Billly and his wife, Katie, have retired to Clearwater. 49 years ago, Billy managed the Stockton minor league club in the California League. A young left-handed pitcher made his pro debut that season on Billy’s staff, Pat Gillick. Billy’s scouting report on Gillick: “Good curve ball, very good control, good move to first base.” Sounds like the fast ball was short. The minor league instructional staff met this afternoon. A week from today, the full camp of 152 minor players will begin daily workouts. All minor league clubs break camp on March 31, except AAA Lehigh Valley. The IronPigs will leave Florida on March 29 and play the first game at Coca-Cola Field the next afternoon, hosting the Phillies in an exhibition game. New outfielder Geoff Jenkins is a dead ringer for Brett Favre, the future Hall of Fame quarterback with the Green Bay Packers. Joe Savery, who had his start rained out last night, idolized Favre as a high school youngster. Savery was a quarterback at Lamar High School in Houston but baseball was his No. 1 love. Joe’s Rookie Diary, a video feature, is on the home page of this site. Back in Philly, season tickets at Citizens Bank Park have climbed to the 19,600 level. The team record is 23,700 in 2004 when the park opened. Season ticket plans will remain on sale throughout the early portion of the season. Guess what. I wrote a brilliant blog yesterday and then forgot to post it. Please, no wisecracks about the memory of Senior Citizens. Weather permitting, the Phillies begin games tonight against Florida State University. LHP Joe Savery is the starter. A year ago he was pitching for Rice University. The young players will get a lot of exposure in the early games. Players will still be dressed and ready to go at 10 a.m. (for 1 p.m. games). Batting practice and infield practice is routine for home games. Fundamental drills, many of which have been on the daily docket, will continue probably 3-4 times a week. With so many pitchers in camp, the Phillies and Pirates have scheduled morning “B” games. Friday’s game will take place at 9:30 at Pirate City, the team’s minor league complex in Bradenton. On Monday, March 3, there will be another “B” game, this one at Bright House Field. Same time, 9:30 a.m. Gates will open at 9:30 so fans can basically see two games for the price of one on that date. Gates normally open at 10:30 a.m.
Today, the players were scheduled to be in uniform at 3:30 for the FSU night game. Jamie Moyer was in full uniform at 1:30 and working on his pick off move to first base on the half field with pitching coaches Rich Dubee and Rod Nichols. He was out there for an hour. He’s still trying to perfect his game. Talk about a professional. The J. D. Durbin golf team of Adam Eaton, Chad Durbin, Joe Swanhart (clubhouse assistant) and Kevin Gregg (media relations assistant) emerged as the winning entry in Sunday’s team golf outing. They were one of three teams that were 13 under. Through a tie-breaker system, they were crowned the champs. First radio broadcast on WPHT Talker 1210 is tomorrow afternoon (Reds) . . . First internet broadcast on phillies.com is Thursday afternoon (Pirates) . . . First TV game on CW Philly 57 is Saturday afternoon (Yankees). Game time in each case is 1:05. Ray Koob of WMGK will be in camp the next three nights, a 7 o’clock to midnight show. Tonight, the show will originate from the Tiki Bar here at the park. Tomorrow and Thursday from the Palm Pavilion, a popular hangout for players and staff on Clearwater Beach. Let’s see. Any news in camp? Yes, Brad Lidge hurt his knee in BP yesterday. Ken Mandel, beat writer for phillies.com, will cover the news on this front when it is available. How do we disseminate news of this kind? Once we receive the test results, Ruben Amaro (Assistant GM) and Scott Sheridan (head athletic trainer) brief the media. We hold off commenting until we have the results and facts. There’s no need to panic. Better to have injuries now rather than in August or September. Ideally, no injuries are the preference. But that is unrealistic in any sport. The annual golf outing for the team is this afternoon, weather-permitting. (Scattered thunderstorms are predicted). 12 different captains held a draft on Friday of players and staff who wanted to play golf. John Ennis is the defending champion captain. “I’ve got a pretty good team (Clay Condrey, Chris Coste, Joe Bisenius, Ron Chiavacci and Gene Dias (CR Director),” bragged Ennis. Where should we check out the tourney? ESPN? Golf Channel? Comedy Channel? “My team will be on the golf channel but some of the teams will definitely qualify for the comedy channel,” laughed Ennis. Cynthia Sass, a nutritionist, spoke to the entire camp this morning. She was brought on board a year ago to stress the importance of eating properly. Healthy food options for the players in the clubhouse and on charter flights replaced previous menus . . . TBS TV was here to tape promo spots with some of the players for use on the national telecasts this season . . . Friday night’s PhanFest at Bright House Field raised $16,288. The proceeds will be divided between Clearwater For Youth, Clearwater Little League and the Hospice of the Florida Suncoast . . . Tomorrow is the final day of the daily workouts as the games begin on Tuesday night with Florida State University. Game time is 7:05 p.m. Mother nature joined the workout today with thunder and rain ending the on-the-field stuff around 11 a.m. The most popular places became the weight room and the two indoor batting cages at Bright House Field. Pitchers migrated to the weight room for conditioning and hitters lined up to get their cuts in in the cages. Hitters never seem to tire of hitting. The games are busy as early as 8 every morning. Before the workout, the players had dermatology and eye exam, a spring training tradition. Rain also cut short a tryout camp at the Joe DiMaggio fields across the street. 70 players who have been in the various independent leagues were invited to show off their skills to the Phillies staff. It is simply leaving no stone unturned. The tryout will continue at 9 tomorrow morning. Ex-Phillie Von Hayes, who will be the manager Lancaster Barnstormers in the Atlantic League, was also on hand to check out the players. Rollins is being recognized for all the charity work he does in the community. Todd Zolecki, in the Inquirer earlier this week, ran a note from Baseball Prospectus.com. The sit released its PECOTA projected standings for 2008: Mets 96-66, Braves 86-76, Phillies 84-78. What does PECOTA stand for? Player Empirical Comparison and Optimization Test Algorithm. Sounds like a runaway computer geek. Notice, common sense isn’t part of the description. Too many dotcoms in this world. Besides, the only PECOTA I’ve ever heard of was Bill, the Atlanta Brave Mitch Williams struck out to give the Phillies the 1993 National League pennant. That’s the in-thing on websites these days. Thanks to Scott Palmer, the Phillies are pioneers in bringing you inside scoops of spring training. Just look for Scott’s photo on the main page and click away. Ryan Howard can be a clown. Check out Scott’s piece on Adam Eaton. Spring training has always come in three phases in my experiences: (1) can’t wait to get here; (2) can’t wait for the games to begin, and (3) can’t wait to get out of here and start the regular season. Well, I believe we’re in phase 2. The daily workouts are pretty routine at this time of the spring. One of the different drills today was sliding for pitchers. Davey Lopes oversaw that drill around 11:30 a.m. The early morning was spent with the measuring of uniforms by Majestic, the official manufacturer of major league baseball. Players took turns going into the multi-purpose room where Majestic reps were set up. Basically, each player gets two sets of home and road uniforms. Jimmy Rollins, Chase Utley and a couple others will have extra pants made because they will rip a few pair along the way. The home uniforms will be shipped late next month to Citizens Bank Park. The gray road uniforms will come down here, be organized and then sent back north on the equipment truck on March 24. Geez, we haven’t even played a game and I’m talking about the truck going back north. Ryan Madson taped a public service announcement for the ALS Association of Florida this morning. Tonight is the annual PhanFest at Bright House Field. Gates open at 5:30 p.m. with fireworks ending the evening at 8. Admission is free. Among the events is an autograph session from 7-8: Jamie Moyer, Geoff Jenkins, Greg Dobbs, Pedro Feliz, Brad Lidge, So Taguchi, Kyle Kendrick and Carlos Ruiz. Fan voting online is now underway for the Phillies’ 2008 Wall of Fame induction ceremony that will take place on August 8: http://philadelphia.phillies.mlb.com/phi/fan_forum/wof_ballot.jsp. Play ball. That’s finally what’s in store now for Ryan Howard and the Phillies. The arbitration panel made a decision and for the last time Ryan and Ruben Amaro fielded contract questions along those lines today. Ruben answered media questions around 9:30 a.m. after we received the news. Ryan met the media following the workout. He was seated on a picnic table outside the batting cages at Bright House Field, surrounded by 23 media types plus seven TV cameras. There was so much media focus on the contact and hearing . . . how distasteful, disruptive, distracting, damaging . . . on and on and on. The hearing wasn’t ugly and a decision was made. We’ve always tried to reach settlement as witnessed by the fact yesterday’s hearing was the second in the last 12 years for us. Arbitration is simply a collectively bargained element designed to resolve salary disputes and it has been around for over 30 years. While today’s schedule was similar to yesterdays, the morning was a bit different as it was MLB photo day. Every big league camp has such an event. There were 13 photography stations set up in two batting cages and outside the cages: Phillies, Associated Press, MLB, ESPN TV, Baseball Digest, Topps Chewing Gum, Photo File, Getty Images, Philadelphia Inquirer, Philadelphia Daily News, Baseball Magazine (Japan), Delaware County Times and Baseball America. We began parading players through the stations at 7:45 a.m. and were finished at 9:30. We had to provide the pinstripe jerseys and an-season cap as opposed to the uniforms worn in spring training. 30 years ago photo day involved the AP, United Press International and Topps photographers. On March 4, we will have a small photo day ersion in the minor league camp, small in the number of stations. But, bigger in another way…150 players to photograph. LHP Matt Smith underwent Tommy John surgery last July 3 on his pitching elbow. It generally takes a year before a pitcher can pitch again. Every day in the clubhouse, there’s a schedule posted listing the work out drills for that day. It is the responsibility of the players to check the schedule and know where they are to be at all times. The schedule is drafted by coach Rich Dubee and reviewed when Charlie Manuel has his daily 8 a.m. meetings with the instructional staff in camp. 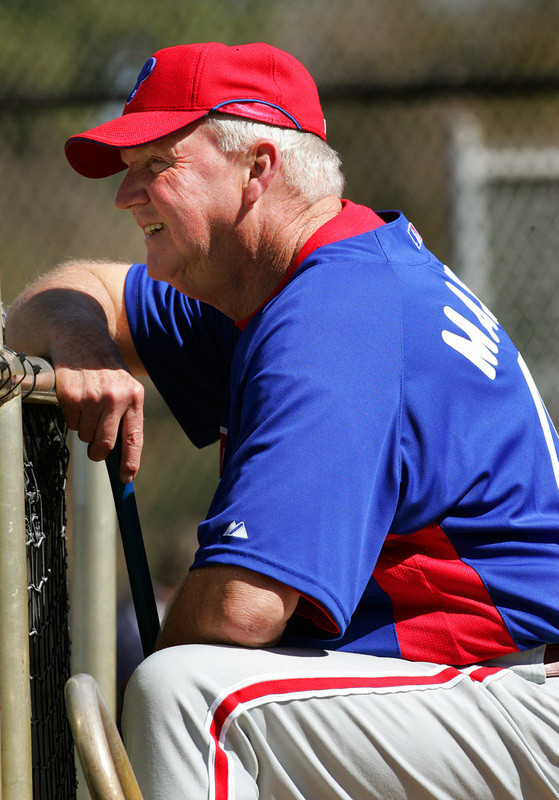 Thursday: MLB Photo Day starting at 8 a.m.
Charlie Manuel’s sitting alone in his office around 9:30 this morning. There’s a yellow pad on his desk. He’s scribbled a bunch on notes on it for his talk to the entire team. Sign on clubhouse bulletin board says, “Dressed 9:45 a.m. Tuesday”. 62 players pulled their chairs toward the middle of the room for the traditional opening day meeting. It all started with a bunch of introductions and a few short business-related speeches. Once all of that was out of the way, Charlie stood up with his yellow pad and went to work. He worked the room well, turning to make sure he could look into the eyes of all the players. Charlie is a very down to earth person, he knows what he wants to say but he also knows he will ramble at times. The usual exercises, long tossing, fielding drills, bunting in the cages, batting practice on four Carpenter Field diamonds and general conditioning took place on day 6 of spring training. The Mike Schmidt Field featured infield practice for the “A” unit of Howard-Utley-Rollins-Feliz. One thing that caught my eye…there were four different instructional staffers hitting ground balls at the same time. It used to be one person would hit ground balls which made it a longer drill. With four fungo hitters, more was done in much less time. Mike Schmidt was hitting grounders to Rollins, Sal Rende (hitting coordinator) to Howard, Dave Huppert (Lehigh Valley manager) to Utley and Doug Mansolino (infield coordinator) to Feliz. Bright House Networks Field will be phasing in a new name over the next few weeks. The word “Networks” is being dropped.